HAPPY HAAB NEW YEAR… Today we Celebrate a New Intention for Humanity on a planetary scale! We completed our climb through the last month of the Haab, the 5-day Wayeb that left Human in charge of the Divine Family of US. The Brightest Light of the Sun, personified as Kinich AHAU, sends the first beam of the Sunrise for 7 Road/EB as the Year Bearer assigned to lead a Very Major Life change… the path to Human’s Divine Destiny. Peak Tone 7 represents the top of the pyramid. From the altar closest to Heaven, we’re offered a Gift of Reflection to see everything Above and Below – all that Is, and all that is Not. Today we See and Acknowledge the Dream we were led to by 6 Deer/MANIK, the last Haab Year Bearer. 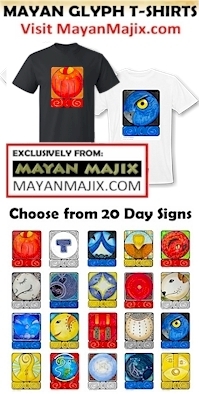 The Mission of the Mayan priest was carried out by MANIK to generate a New Momentum of Spirit. Road/EB is the Day Sign also known as Human. The Aztec call it “The Grass” (Tonali) that reflects Human’s perennial nature. Grasses are among the first living things to grow on Mother Earth. Grass seed’s itself and grows and multiplies by Divine Provision without a Human hand to cultivate the Harvest. Even when winter comes and the Grass appears to have seen its last day, it comes back even stronger in the Spring. Grass Bends, like Reed taught us to Bend to others. Even stepped on and bent to the ground, Grass will make a Comeback. That’s the Light of Inspiration carried on the beam of Kinich AHAU, the Highest Light of Light that heralds Human’s Year! Road/EB is the Day Sign of our Destiny. Our Human Destiny is the journey we make through the unknown experiences of living. We are Sacred for the destiny we all share that wasn’t our choice to make. Human would be the physical manifestation to carry out a Divine Mission below on behalf of its own Divine Spirit. Human would have to bear the scars, the injustice, and the imbalance of everything that wouldn’t be fair on Earth. We will walk the Road of Human Destiny, whether or not we Choose it. The Divine Provision for Humanity is marked by Tone 7. The Peak Tone 7 is the Divine Balance promised by the “Great Law” of Creation, “As Above, So Below.” Human always Receives more than we could ever Earn, when we reach for something Greater. When we Offer our Self to the Journey, on behalf of the Creator’s Dream, we bring into Balance the Promise of a Divine Destiny. Through the Divinity of the Choice, Human’s Divine Destiny is Guaranteed. Today we will know it and see the Vision of it – a Vision of a Dream we see well enough to manifest what we are Offered to Believe. Tone 12 is a day of Understanding. Today offers the Dawning of the most important Truth we needed to Know. The IMIX trecena encouraged us to Dream whatever we wanted to be. We were given the Gifts to Create our own reality. IMIX has been helping us to re-invent our Self. As our Primordial Mother, her Dream is that we would Love our Self as much as she does, and Believe in our own possibilities. We were created for a Divine Relationship that needed Time for Experience. The closest thing the Maya recognize as “God” is the Hunab Ku – everything that ever was or ever could be, God as the Whole of Every Thing. Before The Creation God was a Consciousness of Everything that could be, all at once. In order to have an Experience, one moment had to be separated from another. God knows every moment. Tone 4 is the Intention of Stability. 4 is the number associated with the cube, the most stable of all forms. A cube reflects volume by its dimensions. Tone 4 offers us a sense of orientation, our own boundaries, and Our Rules of our game. Ian’s article, “The Fall of us All,” reflects on Human’s perception of Duality in the “me” vs “them” discernment of reality. Through the billions of sparks of the Creator, each of us offers a different perspective of Truth. Ian’s article shares thoughts on how we reconcile our differences and restore Right Relationship on a global scale. His solution was good news. Ian’s answer was to prepare, pay attention, and Just Be. Road/EB is also Known as the Day Sign of Human, reflecting the Road of Human Destiny. We can create the Life of Happiness we dream by living in a world of Consciousness as a Human, Being. Our Human destiny is the journey we make from the beginning to the end. The glyph reflects the “Road of Destiny” on Human’s head. On either side are the milestones of experience. The Road illustrates that all the Choices are up to us. In the end our lives will be defined by the Choices we make. The milestones acknowledge how Human discerns its direction along the way. By marking our major milestones of Consciousness, we have a place to return to and start again from the clarity of our last understanding. Remembering where we’ve been, the progress we’ve made, and the lessons we’ve learned will be a Guiding Light. Tone 9 is the Peak Tone of the trecena that completes a new transformation of Consciousness. Tone 9 holds the Intention of Patience to see the Big Picture. It comes with a warning that there could be suffering if we fail to see our experience from a Higher Perspective. Road/EB is also known as Human, and represents the Road to our Destiny. Our Human destiny is our journey of life. We are Sacred to the Creator for the Choice we didn’t make to Be Here Now. Our fate in a material world was left to chance. Human is recognized as the “bearer of time,” for the burden of injustice that is not of our own making. Who we become and what we make of our Life was the Choice offered through the gift of Consciousness. The One Choice that changes everything is our own choice to seek the Consciousness of a Divine Creator. Our lives hold greater meaning by taking the High Road that is guided by a Meaning and Purpose that is One with the Whole. The Cherokee Day Sign the Rattlesnake Tooth marks a Spiritual Healing. The Rattlesnake Tooth was a tool of Spiritual Medicine used to break the skin in a Sacred Ceremony of Healing. It left a permanent mark. The glyph illustrates the Road of Destiny on Human’s head. On either side are the major milestones we would mark along the way as our major accomplishments of Spiritual Growth and Transformation. We are marked forever by a Choice to Create our Highest Purpose for Being. The Rattlesnake Tooth is symbolized by a rainbow, an ethereal display created by Light shining through water. The Element of Water holds the Ether of Spirit. The Rainbow was the Sign of a Promise by the Creator to shine through us. Road/EB symbolizes the Covenant of Love between Human and the Creator, the Promise of Justice for all the Divine Choices we make. Portal Days magnify our supernatural experiences through a thinning of the veil to the realm of Spirit. On 9 Road/EB a portal magnifies our Consciousness of our Divine Reason for Being. We were destined for more than just a journey to save our Self. Today a Portal magnifies our Consciousness of our Highest Meaning and Purpose, and our own Power to Create an experience of Happiness and Harmony for the Whole. Tone 2 holds the aspect of Duality. We began in Unity on Tone 1, given an inspiration to create. On Tone 2 we discern what the Inspiration means to us. On Tone 2 we see the ways we are different. We compare our Self to others. We are inclined to see ourselves as better or worse, and long to be One, equal to the Whole. Road/EB is the Day Sign also known as Human, that represents the Road of our Destiny. Our Human destiny is the Journey we make through life. In the end, the experience of who we are will be defined by all the Choices we make. The glyph illustrates that the Road to Destiny lies on the Head of the Human. On either side are the major milestones, the choices that led us in an important direction.